"Our partnership with Google gives our customers the very best cloud has to offer— agility and scale, coupled with enterprise-class security and support," said Chuck Robbins, chief executive officer, Cisco. "We share a common vision of a hybrid cloud world that delivers the speed of innovation in an open and secure environment to bring the right solutions to our customers." 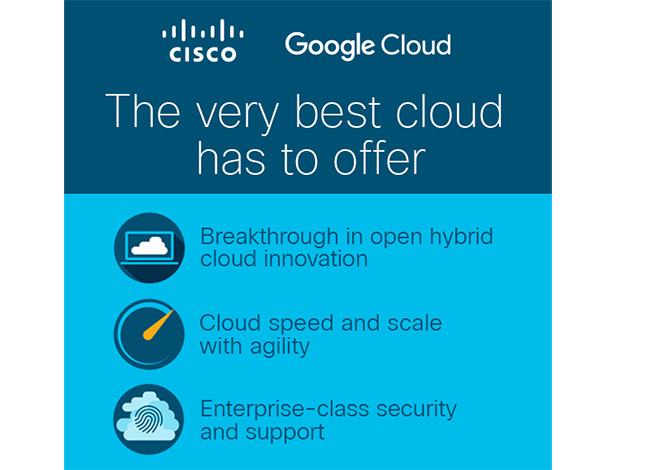 "This joint solution from Google and Cisco facilitates an easy and incremental approach to tapping the benefits of the Cloud. This is what we hear customers asking for," said Diane Greene, CEO, Google Cloud.